Over the weekend I decided to try my hand at vegan puff pastry. While I’ve been dabbling in pastry for vegan pies (will post soon) I’ve wanted to find something more flexible for what I ultimately want to invent – that’s savory vegan pies and tarts of the kind I saw when I was in France. Since the French depend so heavily on the flavor of butter, puff pastry has to kind of taste like it. Thankfully, vegan butter (Whole Foods) does kind of taste like butter. The thing about any kind of fat is that enough of it will make anything taste good. Did my puff pastry taste as rich as the French kind? Probably not. But what the pastry lacks in richness you can make up for with the toppings. For the puff pastry I followed this recipe pretty closely. What I didn’t do was use bread flour. I just used regular organic flour. I suspect you could experiment with lots of different kinds of flour, like whole wheat pastry, or bread flour. It is a tad labor intensive so if you really are bound to a certain kind of flour (like gluten free or whatever) I’d just make regular pastry and not puff pastry, which has to have a gentle lift to it or else it won’t work properly. I didn’t think mine would come out well at all. I was convinced it would fail. But it didn’t. This is a foolproof recipe. The bottom line on this pastry is that it is fattening. It’s full of fat calories, even more than regular pastry. So you have to be careful how much of it you eat. But the reason the French like it as much as they do is that, like most French food, a little bit of rich deliciousness goes a long way. The first thing I made was potato mushroom hand pies. I cover that in the next post. First, here is veganbaking.net’s puff pastry recipe, which is absolutely fully explained – so much so that any idiot could do it. 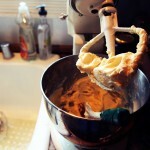 I am lucky to have a stand mixer because without one it might be hard to get it exactly right. Although to be quite frank, any recipe that uses that much butter to flour would be hard to mess up. Pie crust can sometimes be too buttery and literally melt off the pie pan but in this instance you don’t have to worry about that. My modifications are in red. Feel free to use his original recipe – as it’s probably BETTER. That would call for bread flour. 1 Tablespoon soy cashew nut milk – I suspect any kind of “milk” would do fine. In a medium mixing bowl, whisk together the bread flour and 1 ¼ cups of the all-purpose flour and salt. 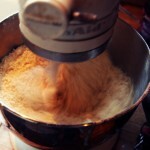 Add the flour and salt to the bowl of an electric mixer fitted with a paddle attachment. Add the Vegan Butter and mix until the dough forms a sticky ball, about 30 seconds. Scrape down the bowl and mix for another 30 seconds or until the butter pieces are no longer visible. Drizzle in the water and lemon juice and mix for another 30 seconds or until the dough forms a smooth sticky ball. If the dough is too wet and doesn’t come away from the sides of the bowl, add up to ¼ cup of all-purpose flour in 1 Tablespoon increments until you get the desired texture. Add the flour and salt mixture to a medium mixing bowl and whisk to combine. Use a pastry cutter to cut in the Vegan Butter until the mixture has pea-sized chunks of butter. Drizzle in the ice water and lemon juice and mix using the mixing spoon until just combined and the butter pieces are no longer visible. Transfer the mixture to a clean counter and quickly knead until the butter starts coming off in your hands, about 30 seconds. If the dough is initially too wet, add up to ¼ cup of all-purpose flour in 1 Tablespoon increments until you get the desired texture. 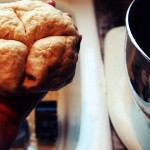 Roll the dough into a ball and use a sharp knife to cut an X shape into the top, extending halfway through the dough. Cover with plastic wrap and refrigerate for at least two hours. In a medium mixing bowl add the 1 ¼ cups Vegan Butter pieces, the half stick of shortening pieces, ¼ cup all-purpose flour and mix on low until just combined. Place the mixture on a sheet of plastic wrap and use a bench scraper to shape to a rough 6 inch square. 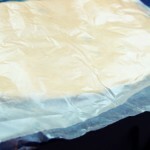 Wrap the Vegan Butter square in the plastic wrap and shape it to a more accurate square. Refrigerate for at least one hour. Place the dough on a lightly floured surface, coat your rolling pin with four and roll out along the X to 12 inches square. Roll three times in each direction using long even strokes, dusting your rolling pin with flour as necessary. Remove the Vegan Butter from the plastic wrap and place it diagonally on top of the dough. Fold the corners of the dough over the Vegan Butter as if you’re wrapping it like a gift. Pinch the dough ends together to seal. Wrap the dough in plastic wrap and refrigerate for at least one hour. The refrigeration allows the fats to resolidify and the gluten in the dough to relax. This causes the dough becomes more pliable and elastic while maintaining it’s strength. Now is a great time to take a break for a day or so. It’s important to not let the dough sit in the refrigerator for more than 3 days because it can start to discolor. Repeat Step 5 two more times so you have a total of 6 turns. This will give you a total of 2187 layers of fat and dough. You now have a world of possibilities awaiting you with your puff pastry which includes turnovers, sticky buns, napoleons, palmiers, cinnamon twists and even pie crusts. Don’t be afraid to let your creativity take control and invent your own desserts. Just keep in mind that the crispy flakiness of puff pastry is often a perfect match with fruit-based fillings or creamy layers. Use the dough wash by applying a coating to the puff pastry with a pastry brush right before you bake it for a golden brown exterior. 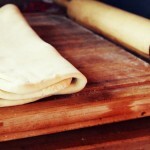 Puff pastry can be stored in the freezer for up to 2 months. Just cover the top of the dough with parchment paper, carefully roll the dough into a cylinder and double wrap with plastic wrap before freezing. 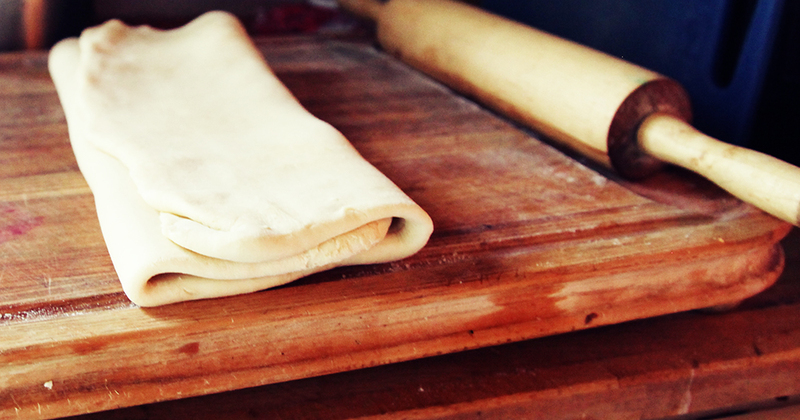 Remove the puff pastry from the freezer and place it in the refrigerator to thaw the night before using. 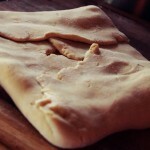 This recipe makes one 20 x 15 inch rectangle of Vegan Puff Pastry. What isn’t so much listed here is that once you folded in thirds the second time you chill it for one hour. Then you take out the folded packet and roll it out again into a flat square. Fold it in thirds, then thirds again (which is called a “turn”). Chill it for one hour. Then roll it out into a square, fold it then fold it then chill it. You do that about five times. I waited until I was ready to use it and rolled it out for the last time. It was so easy I could believe it. Time consuming, yes, but pretty easy overall.